opposite or adjacent to the angle α. To simplify our discussion, we will simply call the 'length of the adjacent side'simply the 'adjacent'. the crane and the crate is 50.5 m. Find the angle between the crate and the base of the crane's body. A steel ladder measuring 23 m long leans against a building and reaches the ledge of a 3rd storey window. from the ground? 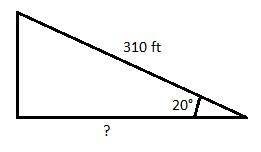 (b) What is the angle created between ladder and the ground? section of the road that rises a vertical distance of 310 feet from Mr. Sander's place? angle from the top looking down to where Molly is? 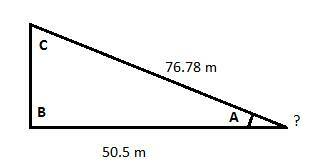 (c) What is the distance between Molly and the top of the hill?